A fine example of Lahontan's scarce and important 1715 map of the Great Lakes, Canada, and the Upper Mississippi. Lahontan's map covers from the Mississippi River eastward to the mouth of the St. Lawrence and the Atlantic Ocean, and from the Hudson Bay to the conjunction of the Missouri River and the Mississippi. The map includes all five Great Lakes in full as well as the various regional river systems. Of the maps associated with Lahontan's narrative, this is considered to be the most factual and informative - his other important map, showing the course of the Longue River (here appearing at the western extreme of the map) is mostly fictional despite being enormously influential. According to McCorkle, the present example corresponds to the first edition, fourth state. It is identifiable by the spelling of Lake erie (Lac errie) and the orientation of 'Nouvelle Angleterre.' Issued in the 1715 French edition of Lahontan's, Nouveaux voyages de Mr. Le Baron de Lahontan, dans l'Amerique septentrionale, published in The Hague. Louis Armand Baron de Lahontan (June, 9 1666 – 1715) was a French nobleman and military officer best known for his extensive, and quite possibly fictional, travels in the Wisconsin and Minnesota region and the upper Mississippi Valley. Lahontan became the Baron Lahontan upon his father's death in 1674. Around 1683, at around 17, he joined the Troupes de la Marine and was sent to New France or Canada. After leading several failed military campaigns against English and Iroquois fortifications around the Great Lakes, Lahontan and his troops integrated with the local Algonquin Indians with whom they lived for several years. During this time he, supposedly, spent much of his time exploring the region, including a supposed expedition on a river he referred to as the "Rivière Longue". Though many consider his tale fanciful, he claims to have followed the river for a reasonable distance to a mountain range. Beyond the mountains, he was told by his American Indian guides, lay another river that flows westward and has an outlet into a salt sea. There are many debates regarding this, some consider it an early reference to the Missouri - Columbia River network later explored by Louis and Clark. Others believe he stumbled upon an early description of the Great Salt Lake. Regardless, his narrative which was published in Europe proved enormously popular and encouraged a number of attempts to search of the Longue River, which it was assumed, was part of a river network extending to the Pacific. The River and other aspects of Lahontan's cartography found its way into numerous influential maps of the period before being ultimately abandoned in the late 18th century. Lahontan, L. A., Nouveaux voyages de Mr. Le Baron de Lahontan, dans l'Amerique septentrionale, (La Haye) 1715. Very good. Original folds. Left margin narrow. Brown University, John Carter Brown Library, E703 L184n2 vol. 2. 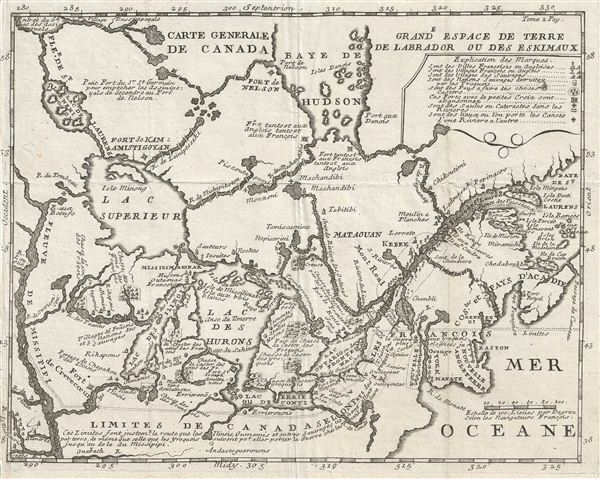 Kershaw, K. A., Early Printed Maps of Canada, 291. Armstrong, J. C. W., From Sea unto Sea: Art & Discovery Maps of Canada, 19. The Map Collector, Quarterly, 19. Bracher, F., 'Ouaricon and Oregon', American Speech, Vol. 21, No. 3 (Oct., 1946), pp. 185-187. Stewart, G. R., 'The Source of the Name 'Oregon'', American Speech, Vol. 19, No. 2 (Apr., 1944), pp. 115-117. McCorkle, B. B., New England in Early Printed Maps 1513 to 1800, 703.2.